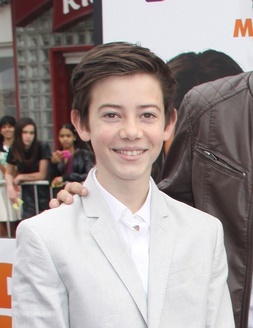 Griffin Gluck is an American actor. He starred in the film Middle School: The Worst Years of My Life. He is the son of Karin Beck, a line producer and production assistant, and Cellin Gluck, a director and producer. Griffin’s father was born in Wakayama Prefecture, Japan, to American-born parents, and was raised partly in Kobe, Japan; Griffin’s father is of Japanese and Ashkenazi Jewish descent. Griffin’s mother has German, English, Scottish, Irish, and Polish ancestry. A picture of Griffin with his father can be seen here. Griffin has said that his Japanese name is Gumanchu. Griffin’s paternal grandmother was Sumiye/Sumi Hiramoto (the daughter of Jitsuro Hiramoto and Takayo Tamura). Sumi was a Nisei (second-generation Japanese). She was born in California, to Japanese parents. Griffin’s grandmother was interned at the Rohwer War Relocation Center during World War II, because of her Japanese ancestry. Griffin’s great-grandfather Jitsuro was the son of Risuke Hiramoto and Hamayo Oda. Griffin’s maternal grandfather is Robert Walter Beck (the son of Walter George Beck and Geneveive DeEtta Metcalf). Griffin’s grandfather Robert was born in Nebraska. Griffin’s great-grandfather Walter was an ethnic German from Russia, the son of George Beck and Elizabeth Wertz. Geneveive was of British Isles ancestry, the daughter of Wilbur Clark Metcalf and Mabelle Etta Cornish. Griffin’s maternal grandmother is Patricia Wynne Cummings (the daughter of John Patrick Cummings and Blanche Constance Krywicki). Patricia was born in New York. John was the son of Thomas Joseph Cummings, whose parents were Irish, and of Mary E. Wynne, who was born in Scotland, to Irish parents. Blanche was born in Pennsylvania, to Polish parents, Maike/Michael Krzwicki/Krywicki and Mary M. Woscavits. I don’t know… Cellin Gluck gave a lot of interviews this year where he described himself as the son of a Jewish father and a Japanese mother (father “grew up in a kosher home in New York” – http://atlantajewishtimes.com/2016/01/ajff-review-unlikely-lineage-fits-persona-non-grata/). And I always hear of British Jews named “Phillips”. He could have considered his father Jewish if his father practiced Judaism, even though he might only have been half Jewish by descent. A lot of celebrities with Jewish ancestry considers themselves Jewish, when in fact their ancestry is mostly non-jewish. Campbell is a very Scottish name. Anyway, I am now virtually sure that this was Lillian’s father (Jay Gluck was probably named after him), which answers the question. How is it untrue? From the top of my head, I can name Beck, Michael Douglas, and Ryan Potter as examples of people of partly Jewish descent who has described themselves as Jewish. There are probably others as well. By the way, how do you determine that a person is Jewish by looking at a genealogy or census? Do you go by their surname? Just curious. You said their ancestry is “mostly non-Jewish”, which isn’t the case with Douglas. Potter and Beck are Jewish through their matrilineal lines. As for the census and other documents, assuming they don’t actually list language as “Yiddish”, I use common sense and other sources. Why? Which example are you talking about? BTW, perhaps Lillian was Jay’s daughter from a previous marriage, although I can’t find evidence that he was previously married. The point is that they all have described themselves as Jewish when they also have a great deal of non-Jewish ancestry, regardless of their matrilineal lines. J. Campbell-Phillips was a famous painter, and his first name was apparently John (I assume it is the same person since both were born in 1873). Hmmm, Jay Campbell-Phillips and his Swedish wife, Martha (Dorph), have no children listed on the 1920 U.S. Census. Perhaps Lillian was the daughter of a sibling of Jay? Lillian was born c. 1904, about five years before Jay and Martha married. It is the only Campbell-Phillips family I can find of the time. This is the family on the 1880 U.S. Census. They have several sons, and I strongly suspect one of them is Lillian’s father. Isaac Phillips was the son of English parents, so probably did come from all those British Jewish Phillips families I often see. Adeline Cohen was from South Carolina. I thought he was full ethnic Russian.